Irresistible snacking! Smart eating! The one the only Smokehouse. From the almond people. Scientific evidence suggests, but does not prove, that eating 1.5 ounces per day of most nuts, such as almonds, as part of a diet low in saturated fat and cholesterol may reduce the risk of heart disease. See nutrition information for fat content. Peanut free. Question or comments? Write Blue Diamond customer support, Sacramento, CA 95812. Please include code number found on bottom of can with all inquiries. 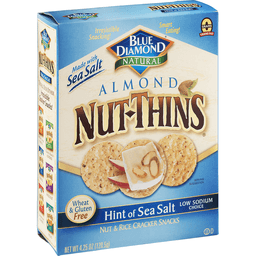 www.bluediamond.com. From the almond people. 5 g total carbs - 3 g fiber = 2 g net carbs per serving. From California. Intense taste! Smart snacking! Artificially flavored. Questions or Comments? Write Blue Diamond Customer Support, Sacramento, CA 95812. Please include code number found on bottom of can with all inquiries. 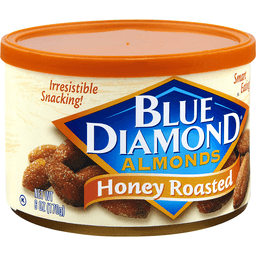 www.bluediamond.com. From the almond people. 5 g total carbs - 3 g fiber = 2 g net carbs per serving. Scientific evidence suggests, but does not prove, that eating 1.5 ounces per day of most nuts, such as almonds, as part of a diet low in saturated fat and cholesterol may reduce the risk of heart disease. See nutrition information for fat content. Peanut free. From California. 6 g of protein. 6 g total carbs - 3 g fiber = 3 g net carbs per serving. Intense taste! Smart snacking! From the Almond People. Scientific evidence suggests, but does not prove, that eating 1.5 ounces per day of most nuts, such as almonds, as part of a diet low in saturated fat and cholesterol may reduce the risk of heart disease. See nutrition for fat content. Peanut free. Questions or comments? Write Blue Diamond customer support, PO Box 1768, Sacramento, CA 95812, or call 1 (800) 987-2329.. Please include number found on bottom of can with all inquiries. 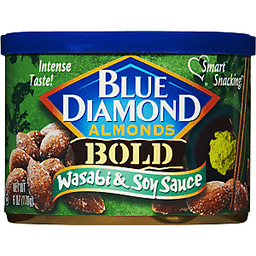 www.bluediamond.com. Does not meet FDA standard of good source of protein. From California. Support honeybees! Honeybees pollinate our Almond trees and 1/3 the world's food supply. The health of honeybees is important so Blue Diamond is donating to Honeybee Research. BeeCause We Care. Learn more at bluediamond.com. Peanut free. Questions or comments? Write Blue Diamond customer support, Sacramento, CA 95812. Please include code number found on bottom of can with all inquiries. 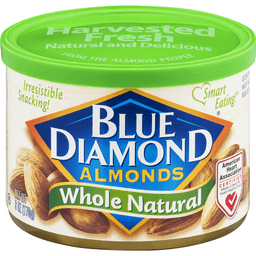 www.bluediamond.com. Save some for later! Resealable package. Bee sweet. Bee crunchy. Bee satisfied. Some bees worked their stingers off to create the honey which we so gratefully incorporated into these special nuts. Taste their sweetness. The nutologists at Emerald are working tirelessly to bring you the tastiest breakthroughs in the realm of nut experience. Partially produced with genetic engineering. Let's hang out! Get social on Facebook or visit emeraldnuts.com. Ask a nutologist! 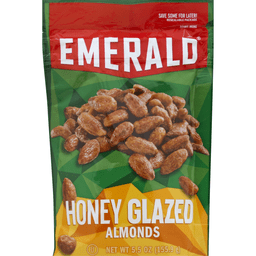 Visit emeraldnuts.com. 6 g per serving. 6 g total carbs - 3 g = 3 g net carbs per serving. Irresistible snacking! Smart eating! From the Almond People. American Heart Association Certified: Meets criteria for heart-healthy food. Scientific evidence suggests, but does not prove, that eating 1.5 ounces per day of most nuts, such as almonds, as part of a diet low in saturated fat and cholesterol may reduce the risk of heart disease. See nutrition for fat content. Peanut free. Questions or comments? Write Blue Diamond customer support, Sacramento, CA 95812. Please include number found on bottom of can with all inquiries. 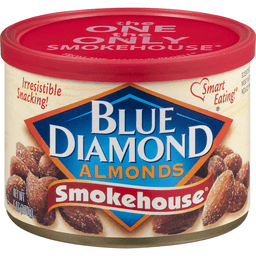 www.bluediamond.com. Does not meet FDA standard of good source of protein. From California. 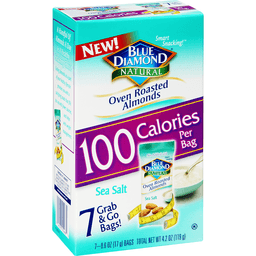 Blue Diamond® Almonds On-the-Go Oven Roasted Sea Salt. 4 g Protein*. 100 Calories Per Pack. 7 - 0.6 Oz (17 g) Bags. Net Wt 4.2 Oz (119 g). Good to go! Tasty benefits per serving. 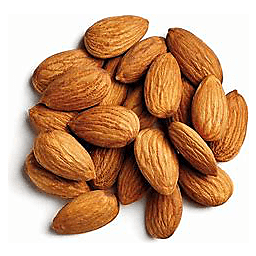 Almonds are cholesterol free. 2 g Of fiber per serving. Rich in Antioxidant Vitamin E. Curb your cravings with delicious, crunchy almonds in a convenient, portable pack. 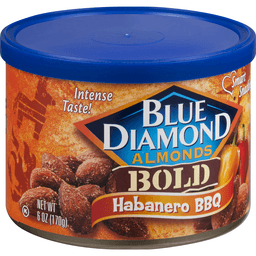 Blue Diamond Almonds on-the-go packs are perfect for snacking on-the-go! From The Almond People®. Peanut free. From California. While many factors affect heart disease, diets low in saturated fat and cholesterol may reduce the risk of heart disease. *Does not meet FDA standard of "good source of protein". Please include code number found on box with all inquiries. Questions or comments Write Blue Diamond Customer Support, Sacramento, CA 95812. bluediamond.com. Intense taste! Smart snacking! Questions or comments? Write Blue Diamond Customer Support, Sacramento, CA 95812. Please include code number found on bottom of can with all inquiries. 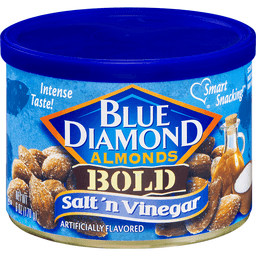 www.bluediamond.com. From the almond people. 5 g total carbs - 3 g fiber = 2 g net carbs per serving. Scientific evidence suggests, but does not provide, that eating 1.5 ounces per day of most nuts, such as almonds, as part of a healthy diet low in saturated fat and cholesterol may reduce the risk of heart disease. See nutrition information for fat content. Peanut free. From California.